At Maurizio Pellizzoni Ltd, our passion is for design and all things aesthetically pleasing. In today’s guest blog by boutique boat rental website Boataffair, CEO Adrian Walker chooses five of the most luxurious and beautifully designed yachts and boats on the market. Sleek lines, stunning interiors and beautiful design are the hallmarks of these wonderful vessels. Boataffair is a peer-to-peer boat rental website where owners can list their boats and you can rent directly from the owner. Launched last year and now operating in over 20 countries across the world, Boataffair’s local community of boat owners specialise in creating one of a kind, authentic experiences for their renters that will not be found in any guide book. Adrian has kindly picked his top 5 yacht and boat designs that will make your jaw drop and inspire you to the sea! It’s Greece, it’s the summer. 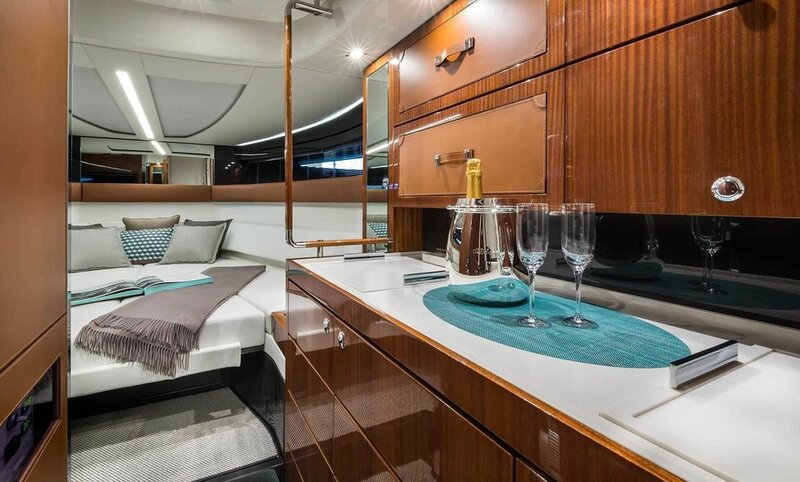 Clear crystal water greets you as you lounge in style in the Azimut Atlantis 51. The tranquil scene is punctuated by your loved ones playing on the wood finished deck before you take a cooling plunge into the Med. The Azimut Atlantis 51 is the perfect yacht for those family summer holidays in Greece, island hopping, stopping off in local marinas and enjoying freshly caught fish and local delights. Designed by legendary luxury yacht designer Stefano Righini, the hard, slender lines of the striking white exterior contrast beautifully with the soft, refined interiors by Achille Salvagni - the famous interior designer to yacht residencies and super yachts. Space abounds in the Atlantis 51, which makes it the perfect vessel for open air living. The wood finished main deck has been crafted as a large open air lounge, sunbeds are present at the front and back of the boat as well as a relaxation area that can be perfectly converted into a more intimate setting for a long lunch or delicious dinner with friends and family. Inside, three spacious cabins greet guests and owners for some ample ‘me time’ and let the little ones do their own thing. Every inch of space is perfectly utilised to create an airy and light feel. Simply put, this yacht is the epitome of intelligence and creativity in luxury design - great for those summer getaways you talk about for years. Picture this: It’s summer, the warm air contrasts against the cool breeze as you pull into Cannes Marina. Superyachts tower over you as you make your way to the mooring. To say the Ventura Rivemare is a classic is an understatement. 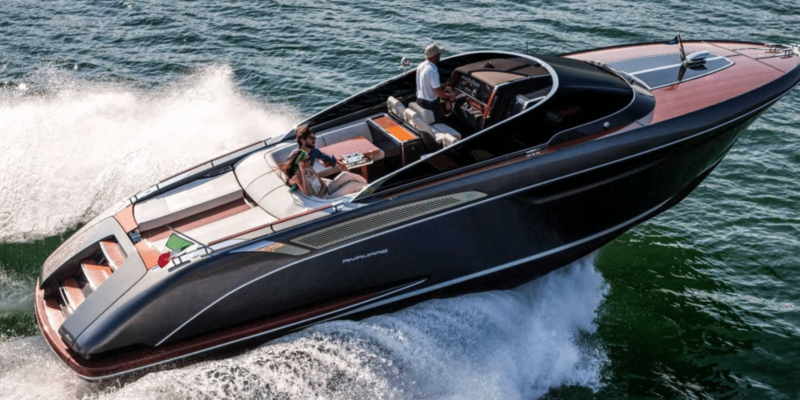 Making its debut at the London Boat Show this year, this boat is something truly spectacular. The seductive, sleek design recalls the glamour from a different age. Chrome plating, mahogany finishes and fine leather seamlessly blend state of the art design with beautiful aesthetics - a model design, classically crafted. This boat comfortably houses two and makes the ideal rental for a romantic break. A sharp chic, spacious interior gives you the perfect amount of space should you want to keep the boat for longer. Want the superstar experience yourself? We are delighted to announce that we have this particular model to charter where you can cruise the French Riviera in effortless style, glamour and supreme comfort. Cruise down to Croatia and spend some quality time with good friends on a yacht of outstanding quality. Discover the Adriatic and the pristine Croatian coast in style. From boutique designer shops to tiny family owned waterside taverns, this yacht is glamorous enough to pull into any marina in the world and spacious enough to embark on unforgettable adventures with friends. Croatia would be the ideal destination to visit with the 55 and makes a perfect two week getaway to recharge your batteries and disconnect from the world. Stop off at the seductive island of Mijet, home to the Mljet National Park where the lush vegetation, pine forests and spectacular saltwater lakes are exceptionally scenic. Mijet offers a peaceful getaway for those late night summer moorings as the sun slowly lowers across the rippling sea.Another sublime design created by legendary yacht builders Azimut that launched at the same time as the Atlantis 51, the 55 is absolutely meant for enjoying with adventurous friends. The exterior is defined by taut, flowing lines drafted by Righini that juxtaposes with the soft, warm and comforting interior by Salvagni. Creative flair abounds within the yacht and its three double cabins where Italian style and design is central to the 55. Grey zebrawood and dark oak, polished black varnish, bronze and steel inlays merge and contrast all through the flowing lines and rounded edges creating a feeling of tranquility an utmost relaxation. The Van Dutch makes a great boat for a weekend break to disappear from the city towards the coast of Nettuno. Each glance makes me fall in love again with the breathtaking avant garde, modernist design. Frank Mulder, the chief naval architect of Mulder Design has created something truly innovative and iconic. The striking minimal features of the exterior is quite simply unlike anything else on the market. The design principle combines intelligence with Dutch playfulness and a desire to create something unique. Sleek decking, a truly magnificent wet bar and redesigned deck table that houses an in built refrigerator, all bare the hallmarks of minimalist style with character. As they say: ‘Arrive in style. Leave an impression’. The epitome of luxe design in superyacht interiors. Sailing Yacht A is equally impressive as an objet d’art as it is a sailing yacht. Described by Boat International as ‘the boundary pushing super yacht,’ Yacht A was crafted by a superteam of designers and engineers. Built by legendary bespoke yacht shipyard Nobiskrug, the exterior was a joint design by Philippe Starck and Dölker & Voges. Futurism abounds in the 148m Sailing Yacht A in a rugged and imposing form with seamless lines united by flowing and organic shapes. Giant proportions rain down - the world’s largest single piece of curved glass (192 square ft). 8 decks connected by elevators, a helipad and a 30m observation pod. The design unparalleled, the scale unimaginable. The studio recently had the pleasure of being invited to a private tour at Imperial Bathroom’s wood and ceramic factory. Based in Aldridge, a historic town in the heart of England famed for its rich history of clay and brick production, the company thrives to keep local craftsmanship alive. The team of time-served craftsmen utilise skills passed down by generations to make beautiful bathroom products from wood, clay and other natural materials from traditionally handcrafted bathroom furniture made with jointed solid wood and genuine wood veneers, to the beautiful range of brassware, manufactured from cast brass. Maurizio was introduced to a stunning collection that displayed the versatile and diverse range of fine quality bathroom products and given exclusive access to see the dedicated and skilled workforce employing traditional techniques to handcraft the collections at their factories. Maurizio found it enlightening to see the process of how Imperial Bathrooms flawlessly manufacture their ceramics in their entirety, from the design on paper to the end result - the handcrafted perfection that no machine can alone truly replicate. The culture of the family business shone throughout and he found it compelling to see how carefully and expertly each piece was made by hand with such attention to detail. Maurizio gained some fantastic knowledge and insight behind the brand and was inspired to continue to use the ranges knowing how much love and passion goes into producing the ranges. At Maurizio Pellizoni Ltd, we draw inspiration from a range of sources from fashion, design and art to cultural developments. We believe that in order to produce inspiring designs and to remain at the forefront of luxury interiors, that it’s imperative to be open to new trends across the creative industries. We work closely with art galleries and use art in our projects to enhance and complete our design schemes, offering our clients beautiful pieces that complement and unify a space. In our latest blog, Leslie Pratt, the director of Cricket Fine Art London and Hungerford, shares her expertise on how art transforms newly designed spaces and existing rooms. When choosing art for your home, it’s important to consider three key points that can serve as a guide to help you find a piece that brings your space and home to life. 1. How does the artwork complement the existing scheme of the space? 2. Is it intended to be the focal point of the room or an additional piece being added to other artwork already hanging? 3. Always be sure to choose pieces that you are going to enjoy for years to come. Paintings are the icing on the cake in any room. They bring a space alive and give warmth and character to any home. They can be restful, uplifting and often tell a story. Choose colour palettes that you like. Pick out colours in your artwork with cushions and other accessories. Different themes, moods and atmospheres can be created, for instance, a warm cosy look, can be arrived at with groups of pictures hanging on a wall. A more contemporary look can be completed with the use of large abstract pieces. It is always a pleasure to help clients choose work for their homes and often specific pieces will spring to mind when seeing the space that the client might not have previously considered. Every piece of art has an intrinsic quality but personal tastes and preferences play a central role. Cricket Fine Art’s role is to understand its clients tastes and guide them towards work that they will like or alternatively to work closely with interior design companies to help source and supply work for their projects. Established over 20 years ago, Cricket Fine Art specialises in contemporary art, both figurative and abstract and represents a wide range of talented emerging artists working in different mediums, sizes and subject matter. For more information on Cricket Fine Art and its artists contact the contemporary art gallery London via info@cricketfineart.co.uk or on 0207 352 2733. Cricket Fine Art’s mixed exhibition is currently showing at both its galleries in London and Hungerford. Maurizio Chats to James Swan about design, decoration and beautiful living.